I don't know exactly what it was that attracted me to this shot. It's probably got something to do with the geometry. I like lines, intersections, balanced and neatly arranged shapes. Scenes that are out of balance (from my point of view) bother me. It makes me want to go in and see what's behind the door. 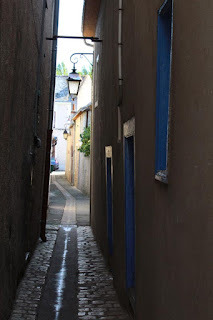 This is the entry to a house's courtyard/driveway on one of the main streets through Le Grand-Pressigny. 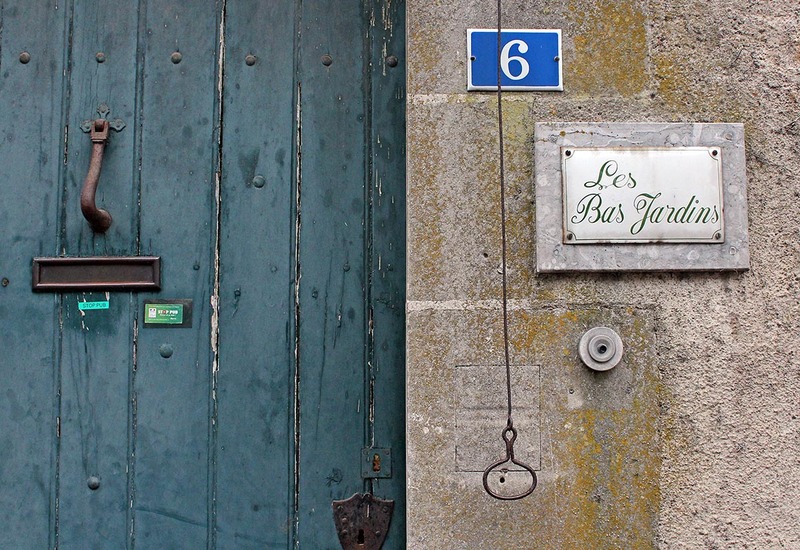 The sign on the right says Les Bas Jardins (the lower gardens), presumably the name of the property. 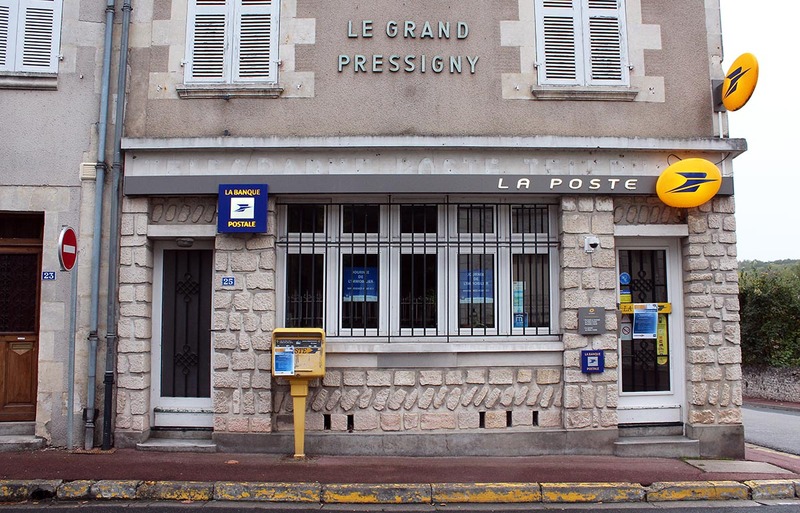 The iconic poste (post office) in France is a venerable institution and one that French people can still count on. When you mail a first class letter within France, chances are it will arrive at its destination the next day. When you want to refer to something as easy and quick, you say that it moves comme une lettre à la poste (like a letter in the mail). No problem, smooth sailing. La Poste du Grand-Pressigny. Click to special-deliverate. The post office was also a place to make phone calls back in the day when not everyone had a phone in their home. When I was a student in Paris in 1981, I went to the post office to make phone calls in one of the private cabines (phone booths), often having to stand in line until one was available. That service has dwindled now that most people have cell phones. But another service has grown: la banque postale. Yes, the post office is also a full service bank with its own ATMs. The color brand of the la poste is bright yellow, as you can see on the signs above. Letter boxes are yellow. Mail carriers drive yellow cars and vans, and in some places they ride mopeds or bikes, also yellow. Before the name changed to La Poste, the post office was called the P.T.T., Postes, Télégraphes, et Téléphones. In those days the post office was also the phone company; that changed in 1988 when France Télécom (now called Orange) was created to manage telephone (and now internet) service. On most poste buildings around France you can still see the ghosts of the old signs. In the photo above you can just barely make out the old words on the white band above the newer gray strip where it says "La Poste." 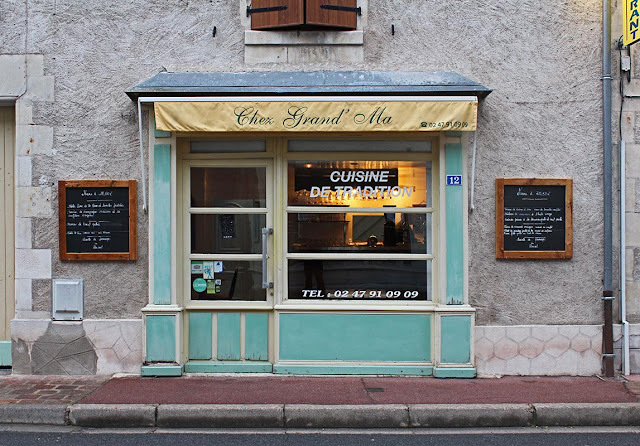 This little restaurant in Le Grand-Pressigny looked very inviting. I saw whom I assumed to be the chef milling around behind the bar when I was taking the picture. He actually came out to see what I was doing, so I said, "Bonjour! 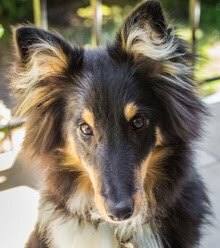 La lumière est très belle, n'est-ce pas?" (Hello, the light is very pretty, no?). Chez Grand' Ma au Grand-Pressigny. The menu on the left is €17,50 and the one on the right is €20,50. Are you noticing a theme here? This is a fleuriste (florist) in Le Grand-Pressigny. And, again, I didn't see anyone in this shop. Although, I'm certain that if I had gone inside, someone would have immediately shown up to help me. Lots of plants and flowers to choose from. 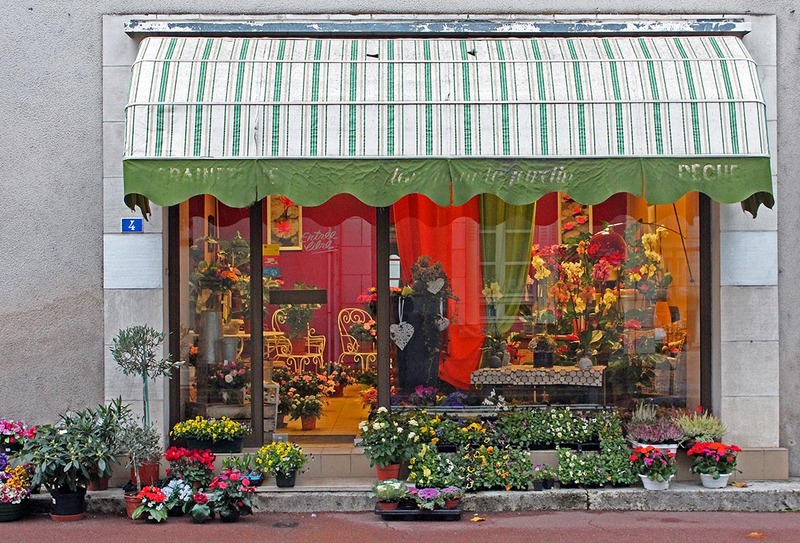 Flowers are a typical "hostess gift" in France. We just had a beautiful Saturday. Sunny skies, but cold. 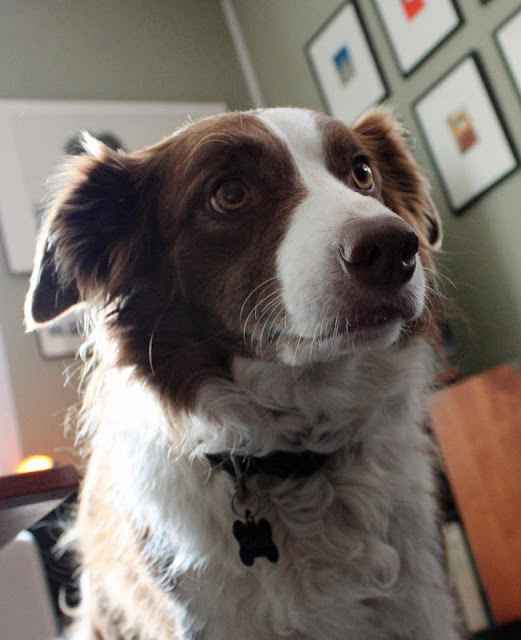 We turned on the central heating in the morning and I got a fire going in the wood stove, of course, in the afternoon. I guess we're in fire season now. While I really liked the butcher's red-painted storefront, the purple on this boulangerie (bakery) in Le Grand-Pressigny is my favorite. Even if the shelves aren't as full as they might be, I am still tempted to step inside. I think the teal-colored marks on the curb mean no parking, but stopping is allowed. Normally they'd be yellow. 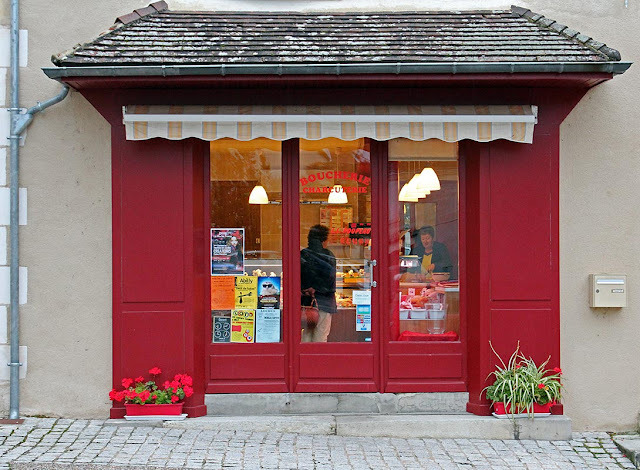 The bakery makes a specialty called une Pressignoise (the small writing on the left-hand side). 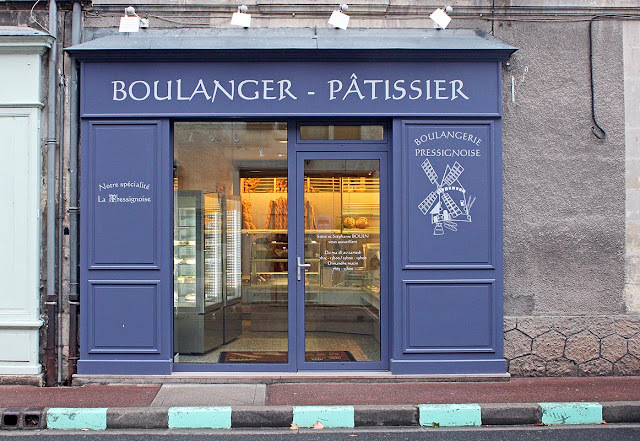 I don't know if it's a bread or a pastry, but I'm sure some of my readers who know this place could tell me. A couple of weeks ago we happened to be in Le Grand-Pressigny, a town about an hour south of us. We took Callie out for a walk in the early evening before dark and I had an opportunity to snap some photos around town. I wasn't optimistic because the sky was overcast and it was spitting rain. I was pleasantly surprised when we got home to find that most of my photos turned out okay. This is a boucherie/charcuterie (butcher shop/deli) in town. I was drawn by the warmth of the lights inside and the woman waiting on the sole customer. I think she smiled when she noticed me outside taking the picture. 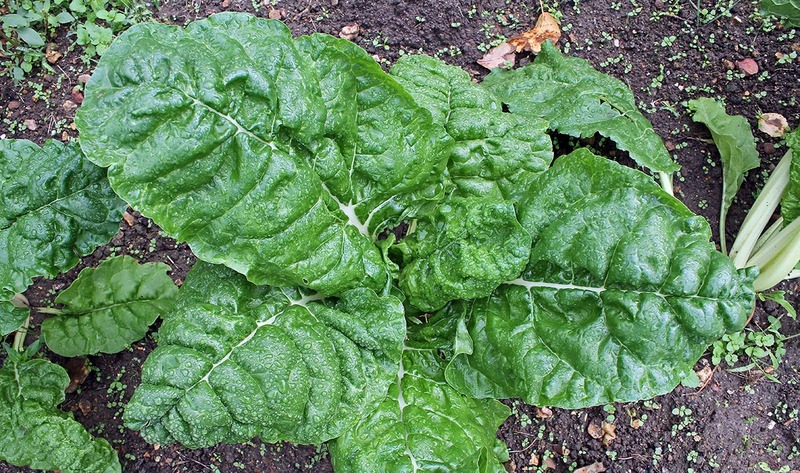 How chard can it be? 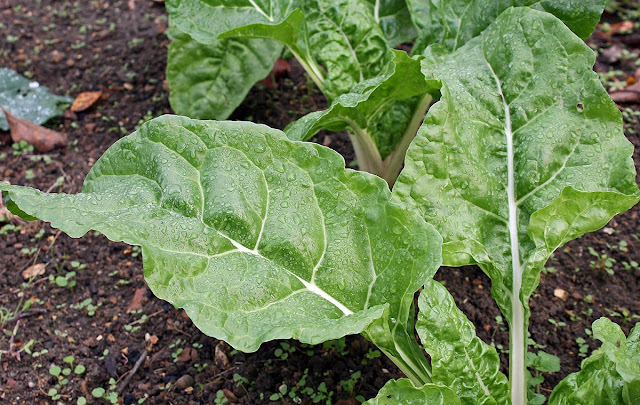 This year we planted a fall crop of blettes (Swiss chard) and we've just started harvesting it. I made a quiche with the first leaves we picked. Blettes in the garden. Yum! I added smoked lardons (bacon) and chunks of goat cheese to the quiche. It was great. The chard should continue to produce until we have a hard frost. I'll probably blanch and freeze some of it for use over winter. 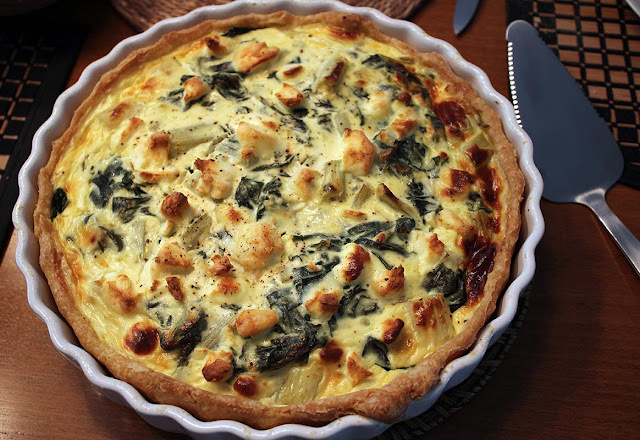 Blettes and goat cheese baked into a quiche. We're also eating the collard greens that got planted at the same time. Again, we will likely freeze some for winter in the coming weeks. Beautiful chard leaves. Tasty and sweet! I may plant more in the spring, depending on what else we decided to put in next year. Stay tuned. 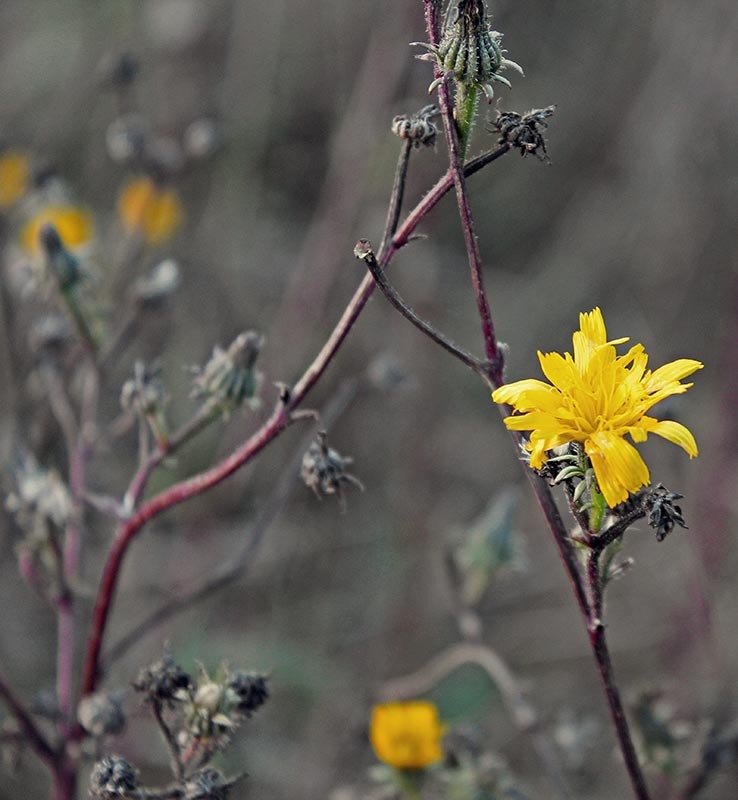 This is what yesterday's yellow flowers look like when they've gone to seed. Ensuring a fresh crop for next year. I feel bad for those of you in the US who are being subjected to the final weeks of political advertising. In fourteen days it will be all over (at least for now). For this year, at least. There are still a few hangers-on as we have not had any real cold weather yet. November should bring us a few frosts and that should do in these last wildflowers. 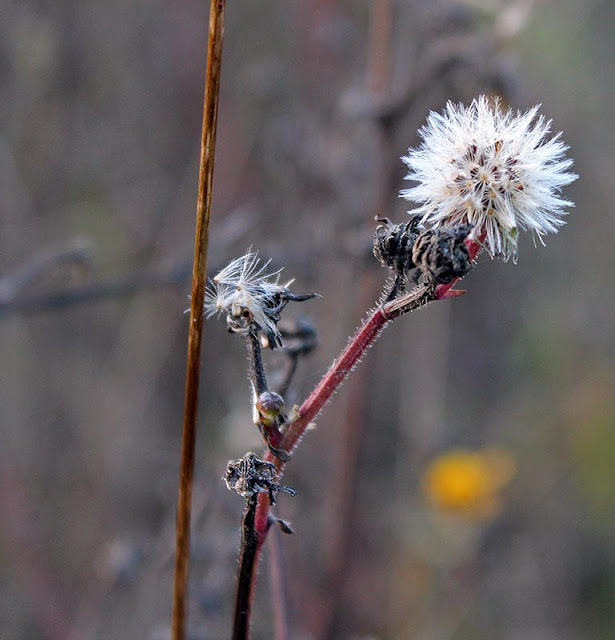 The fields are increasingly tan and brown, but a few spots of color remain. November also brings us high-pressure temperature inversions. The result of that is often very still air, thick with dripping fog, keeping daylight hours a leaden grey, and crisp, clear nights. Before our current rainy spell started, we had some nice sunny days with big puffy clouds all around. The skies were pretty dramatic. The view from down in the valley. The vineyards are up beyond those trees. 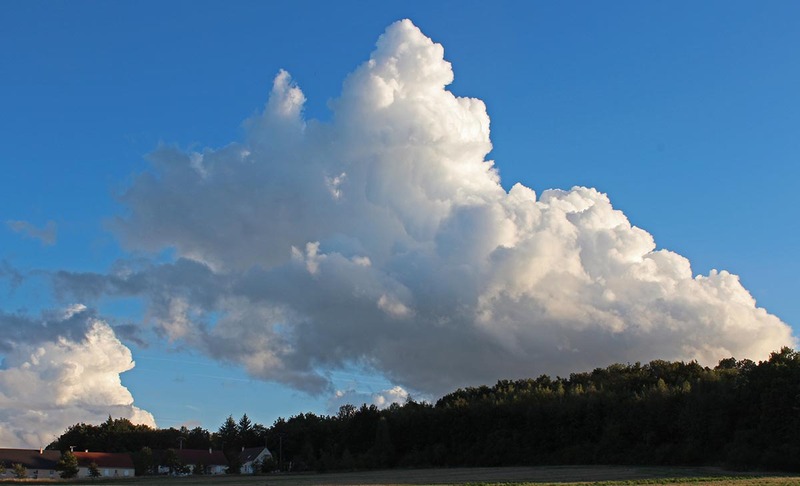 Now, after about two weeks of rain, drizzle, fog, and general dampness, we're looking forward to a few sunny and dry days. We've still got some cleaning up to do in the yard and garden before the onset of winter. Just because. I forgot about this picture from about a month ago. There are a few nice views down between the buildings along the rue Nationale. This is one of them. I really worked on this picture (post-processing), trying to get it just right. You will be the judge. 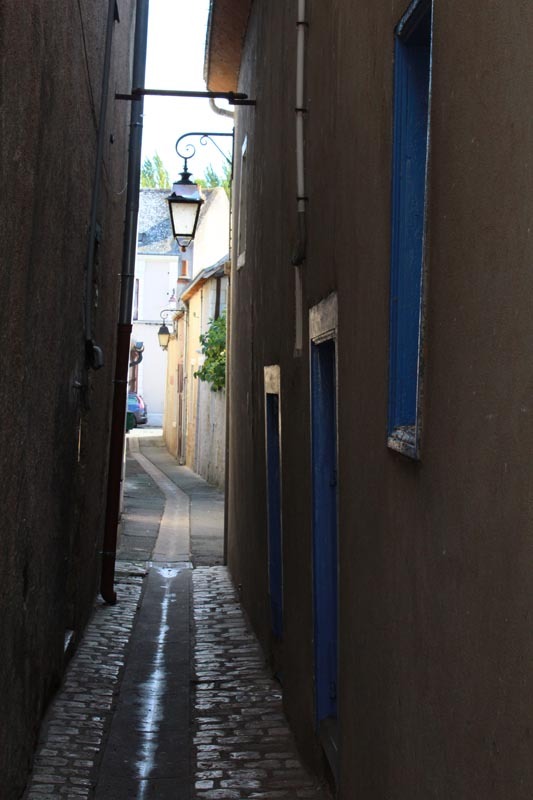 Looking down an alley in Amboise. So what do you think? I had a hard time dealing with the light and the shadows. I don't take very many people pictures, especially of people I don't know. But once in a while the opportunity presents itself. I was far enough away that these people really didn't notice me, and I was at the foot of the château where several other people were taking pictures. Souvenir place mats for sale at the shop next door. If you're going to hang out in a tourist hot spot, you're going to end up in more than a few tourist photos! An hour or two earlier and this place would have been filled with people eating lunch. When I got there it was mid-afternoon and there were just these few stragglers finishing up. 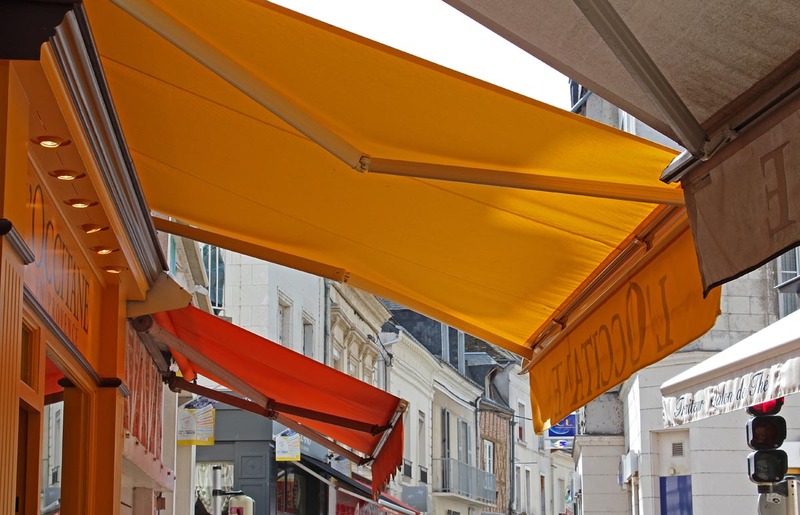 The sun came out enough to brighten up these awnings along the rue Nationale in Amboise. 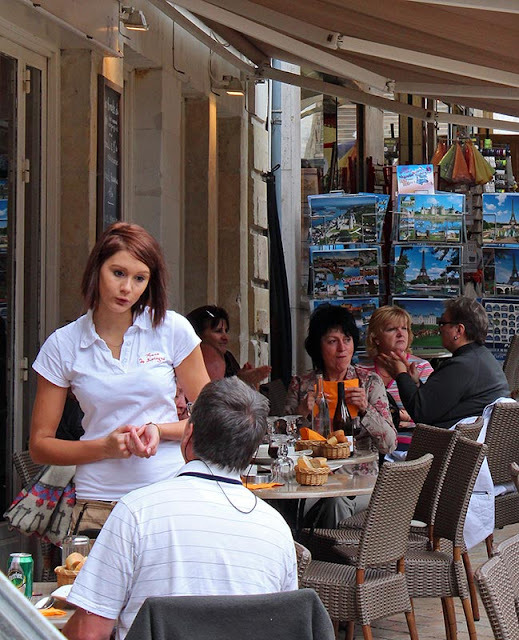 The central street in town is for pedestrians only and is lined with inviting shops, cafés, and eateries. It's not all tourist-oriented, especially as you get farther from the castle. Amboise's population is about 12,500, so there are a good many people in town to support local commerce. 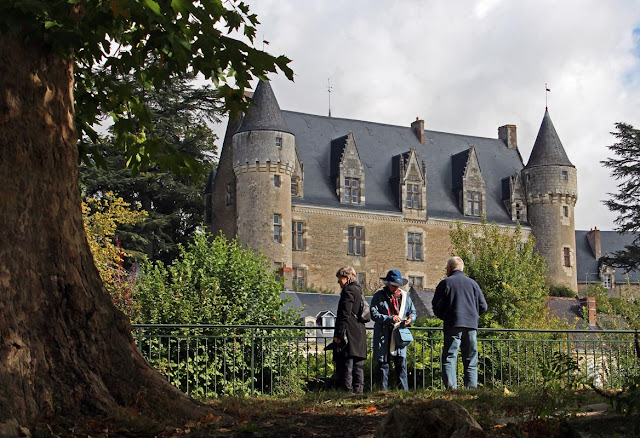 The tourists do their share, of course, as Amboise and its château overlooking the Loire River draw large crowds. Not to mention the huge Sunday market along the river which pulls in shoppers from all over the region. 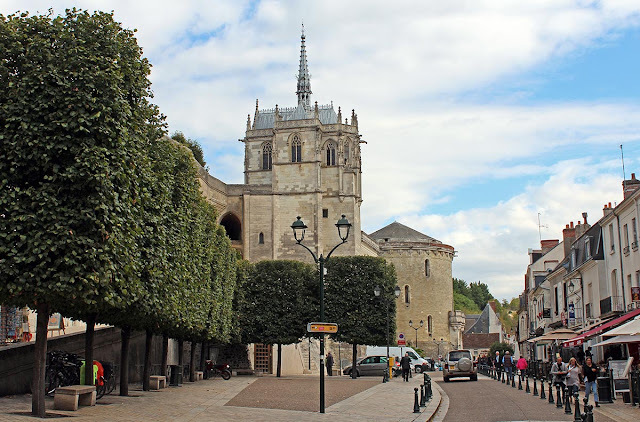 On this visit to Amboise, we didn't go into the castle nor did we spend a lot of time. Just a quick walk-through to see the town with our friends. We stopped at a butcher shop for a chicken to roast that evening. 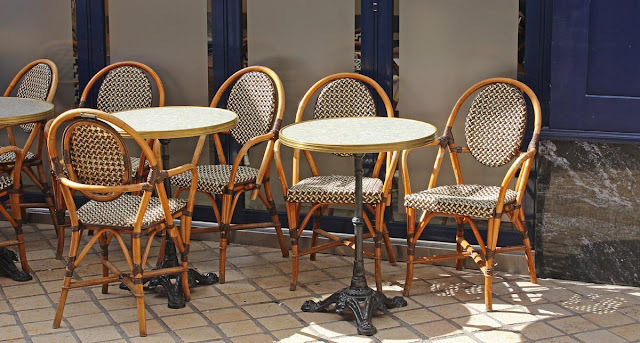 Lots of seating available in the cafés! The weather was ok and there was a shower or two, but nothing serious. And it wasn't crowded. A Thursday afternoon in late September is not a busy time. There were plenty of people, but nothing like we'd find in July or August. This little high-gothic chapel built on the ramparts of the Château d'Amboise is the final resting place of Leonardo da Vinci. He is supposedly buried under the floor of the chapel; a stone marker indicates the spot. La Chapelle Saint-Hubert at Amboise, built in the late fifteenth century. Da Vinci was brought to live at Amboise in the last years of his life by King François I. You can visit the house he lived in; it's been made into a da Vinci museum and is filled with personal effects and models of some of his engineering designs. Here's Bert keeping an eye on Callie, who is on the other side of the fence sniffing around for the cat. She never found him. This is at one of the other houses in our hamlet, which is currently unoccupied. 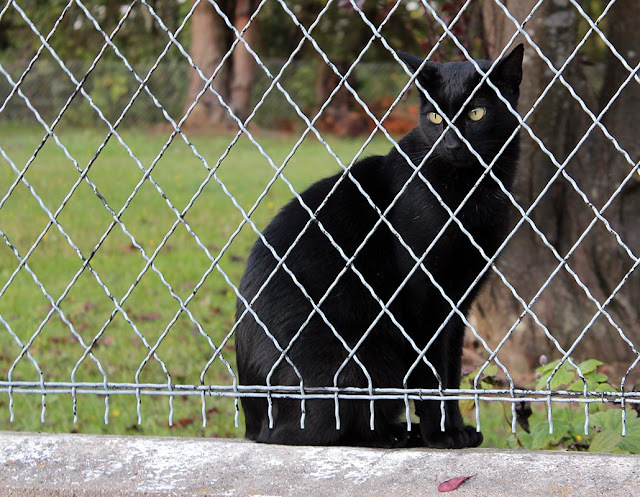 Sitting still, stealthy, watching the dog from a perch on a half-height wall, behind a fence. 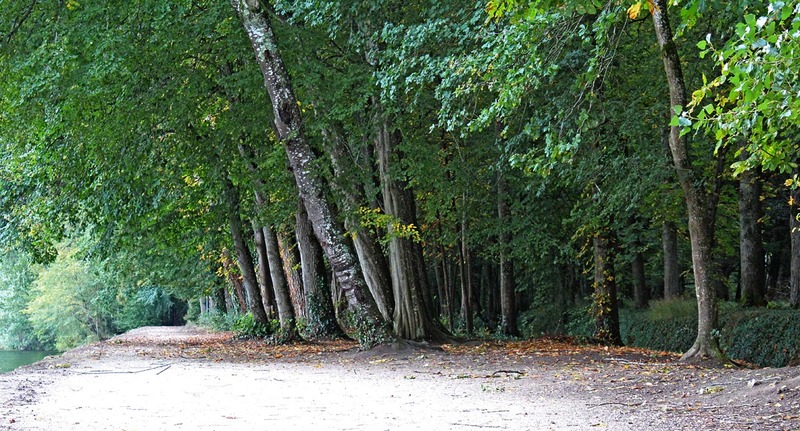 As promised, here's the view of Chenonceau that you get while walking along the path on the left bank of the Cher. Not bad, eh? The freebie view of Chenonceau castle. Click to encastellate. The river flows lazily under the arches. In summer it's not unusual to see a kayak or two on the water. By the way, the water is nearly crystal clear. The river bottom is visible and fish abound. 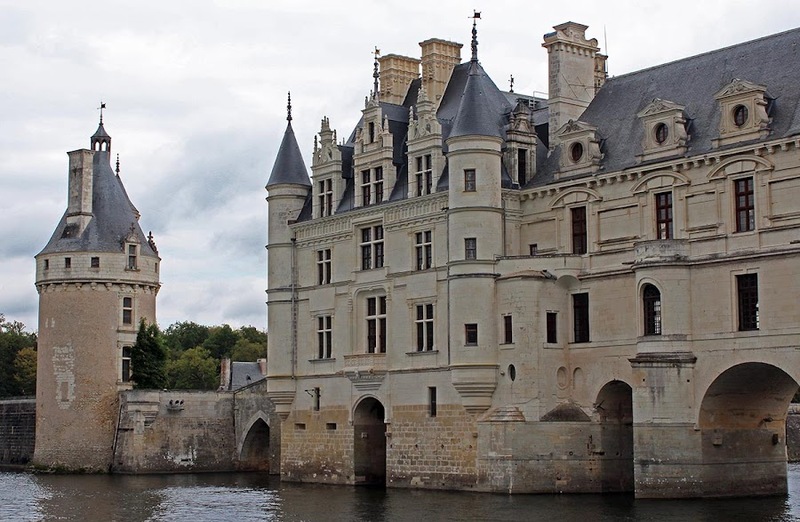 The famous Château de Chenonceau spans the Cher River not far from where we live. We find ourselves taking guests there frequently. It's probably the castle I've been in the most these past nine-plus years. 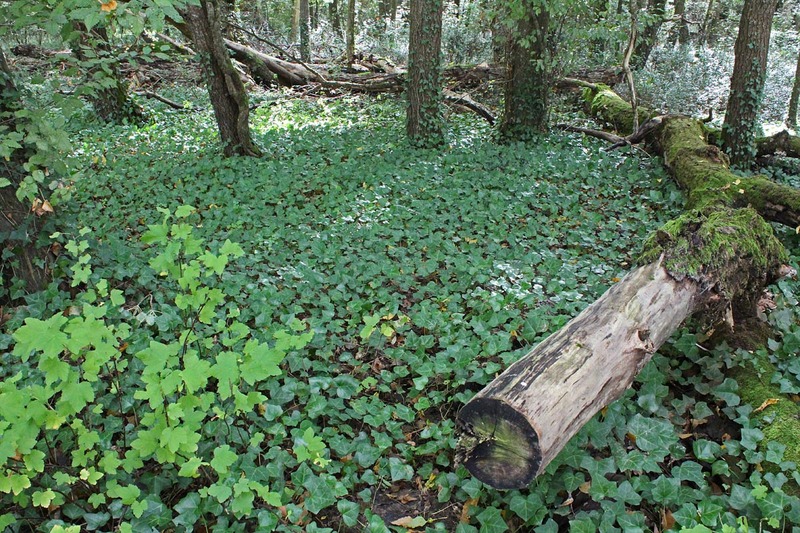 A typical scene in the forest at Chenonceau. But the entry fee is not cheap and, while guests will often pay my way (which is very kind indeed), we sometimes don't really want to go inside and shuffle around with all the other tourists in high season. As an alternative, there is a path on the left bank of the river that takes you right up to the castle. On one side of the path is the river and on the other is part of the castle's forest park. You can walk right up to the building and touch it, but you can't enter. It's great when you just want to see the outside of the castle without the hassle. 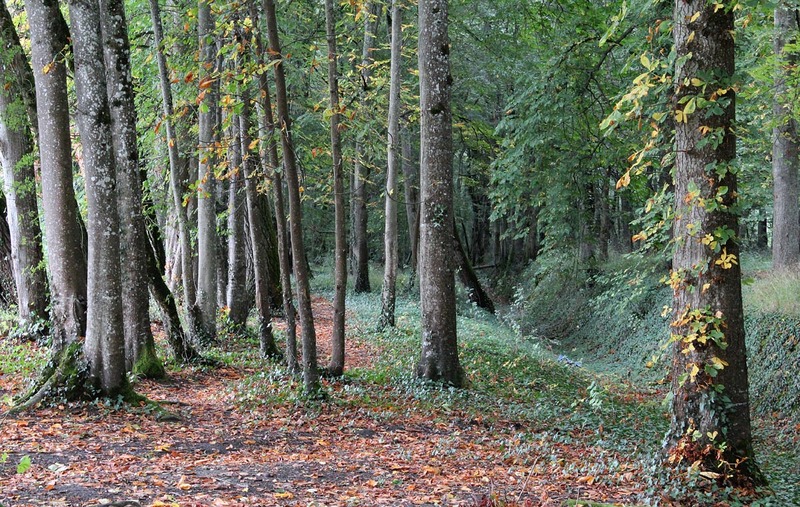 The walking path, river on the left, forest on the right. The castle is not otherwise visible from any road as it sits back in its park and gardens, away from town. It's definitely worth paying the entry fee and seeing it once in your life, but the walk is free and the castle is just as impressive either way. I'll show you the castle itself tomorrow. Of course, you can always click on the "chenonceau" label just below and you'll get all the posts I've done about the castle. I think this varietal is côt (malbec) based on what we've been told by the growers. The change is accelerating. The red maple trees in our front yard are beginning their turn toward orange, after which their leaves will fall into the driveway. The birch trees all around are getting more and more yellow. And there are accents of brilliant red here and there. 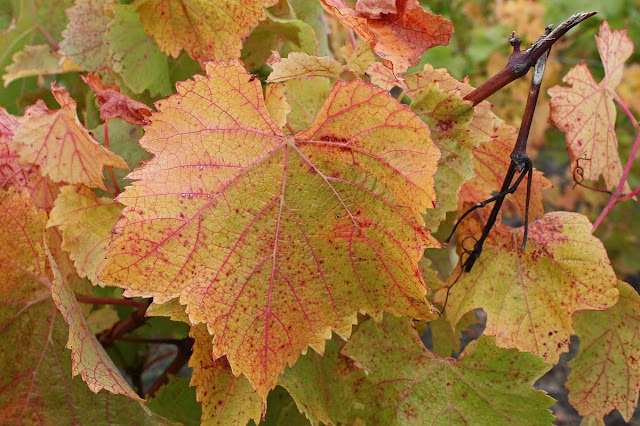 This is probably grolleau (a Loire Valley varietal), again based on what we've been told in the past. Our fall is not as dramatic as a New England, Northern US, or Canadian autumn; you'll find no "leaf peepers" in our parts. But it's still pretty. From the church up on the heights, you can either walk a little farther up to the château or take the little street that winds back down along the castle's base. We chose the latter on this particular day. Winding down through town. 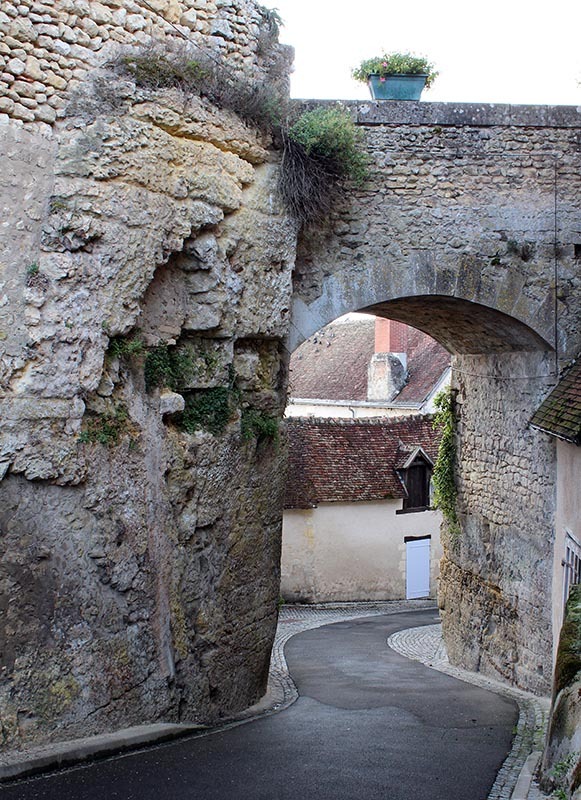 The bridge above the street leads to the castle. The old town hugs the base of the château on the right bank of the river. There's a newer section of town along the main road on the other side of the castle. That's where most of the businesses (restaurants, post office, etc.) are located. 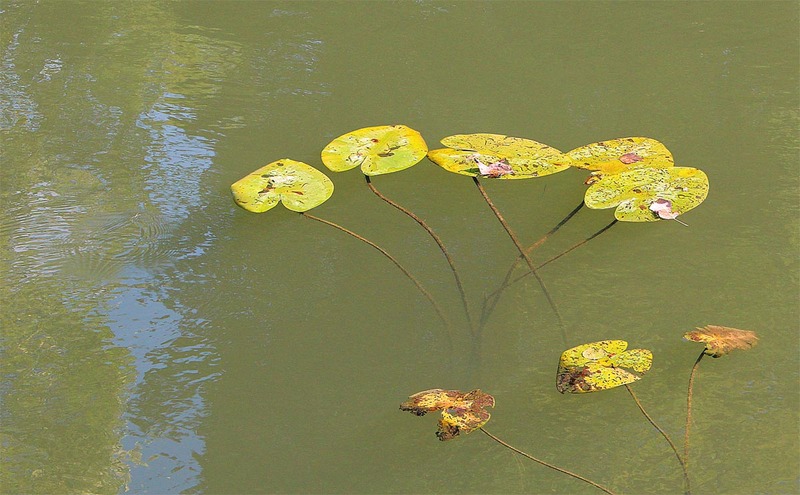 The lily pads floating in the lazy Indrois River reminded me of Claude Monet. There were even several arched foot bridges over the river, similar to the one in Giverney made famous by the painter. And although this photo in no way resembles a Monet painting, it reminds me of that. A few of the hundreds of lily pads I saw in the river. Click to impressionate. The warm and wet weather we've been having for a few days now has started the grass growing again. In fact, weeds of all kinds are popping up all around, in the yard, in the garden, in the vineyard, and in the woods. The next dry stretch we get will see me out with the lawnmower, maybe for the last time this year. As this week is projected to be a wet one, I thought on Sunday that I should get some harvesting done. I went out and pulled up all the bean plants. I plucked all the beans from them and we'll go through and shell the ones that can be shelled and cook up the rest. Winter squash from the garden: potimarron (red/orange) and patidou (yellow and green). Click to cucurbitacate. I also picked the winter squash before it had a chance to rot on the muddy ground. It's not a big harvest, but there's enough to keep us going for a while. I left the two butternut squashes out there because they didn't look quite ready for picking yet. I'll keep my eye on them. 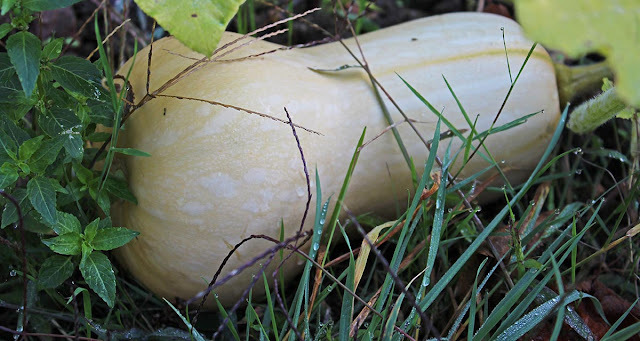 One of two butternut squashes still in the garden. All of these squashes came from seeds that were saved (by us or a neighbor) and not from seed packets. 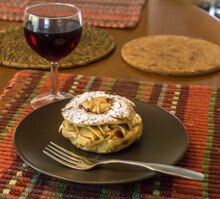 The only real surprise is that the patidou (similar to acorn squash) reverted to prior forms. 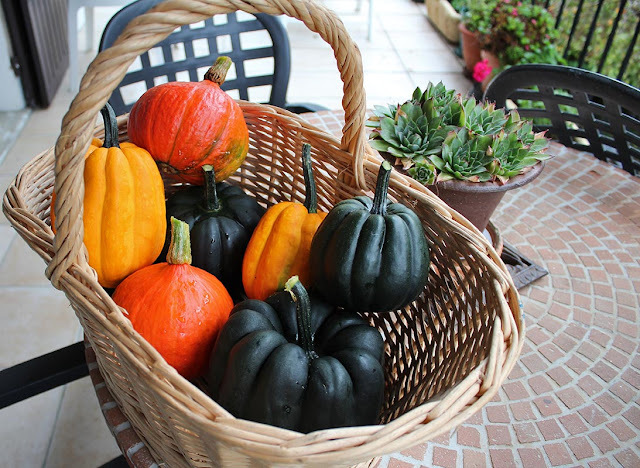 One plant gave us the oblong yellow squash and another gave us the dark green pumpkin-shaped fruit. The original squash looked exactly like a cross between these two, so it kind of follows. The three dark green squash came from two plants. The two yellow squash came from one plant. Each of the potimarrons came from its own plant, and the two butternuts (not shown) come from two plants. I don't know why each plant produced only one or two fruit this year; that hasn't been my prior experience. It has been a funny year in the garden. Here, once again, is the church in Montrésor, St. Jean Baptiste. 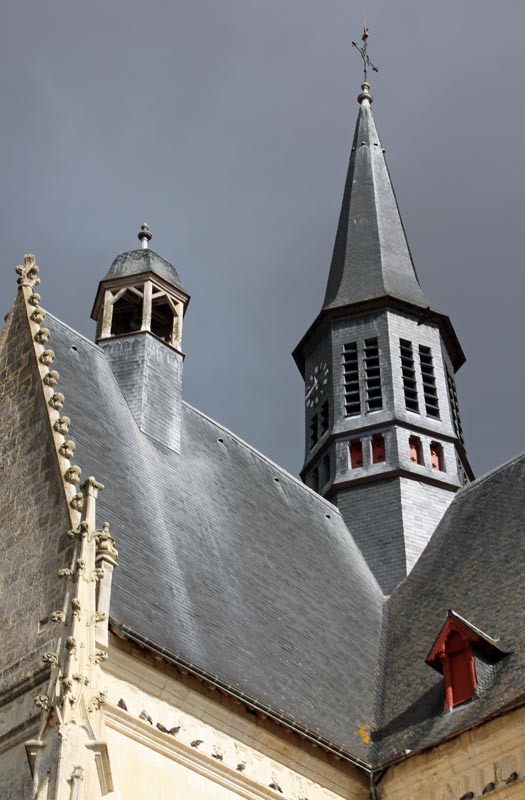 The roof is covered with slate tiles and the spire is the tallest structure as far as the eye can see. The roof and central bell tower and spire. I think I already mentioned that the church was built in the sixteenth century. I didn't spend a lot of time inside, nor did I take many photos. You've seen one of these and you've pretty much seen them all. 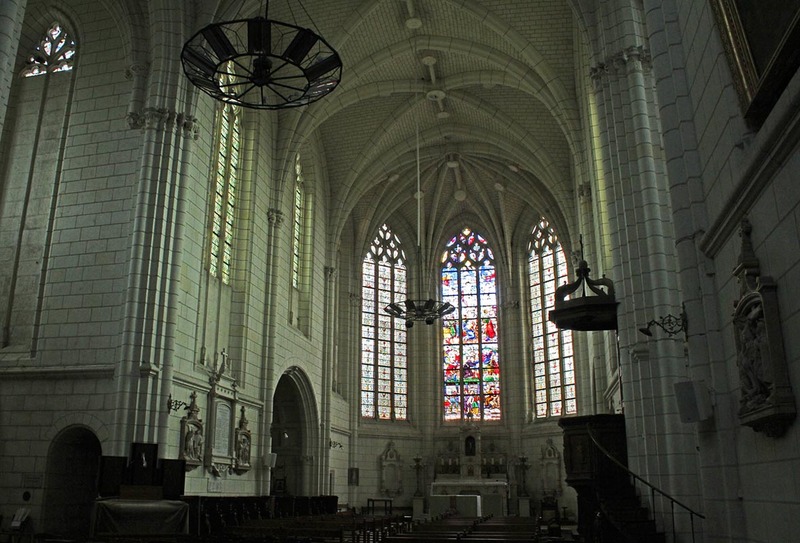 Still, here's a shot of the choir from the nave with the nice stained glass windows behind. Well, so do I. On Thursday Ken picked what may very well be the last tomato harvest of the season. 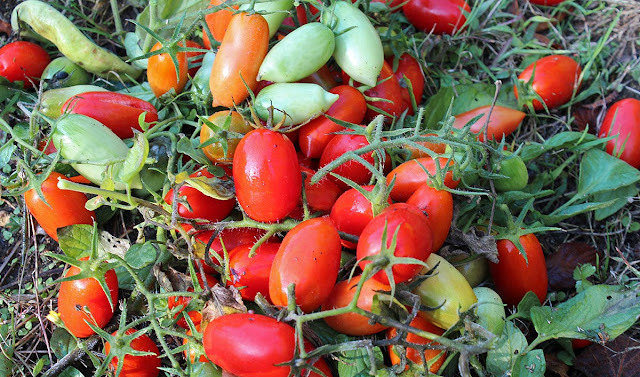 He got a bucket full of ripe and ripening fruit, along with this pile of smaller tomatoes. These are called "Juliet" and they're larger than cherry tomatoes, but smaller than Italian romas. Juliet tomatoes in varying stages of ripeness. They should all ripen up in the kitchen in the next week. Speaking of cherry tomatoes, our plants have outdone themselves and we have way more than we can deal with. 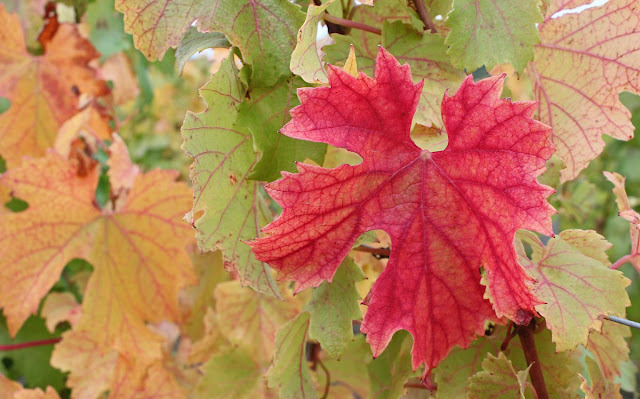 There are still hundreds of red ones out there on the vines. One can only eat so many cherry tomatoes in salads. We've also been cooking with them and making sauce with them. We'll probably pick what we can and add them into the next batch of sauce for freezing. Ok, I'll stop after this. 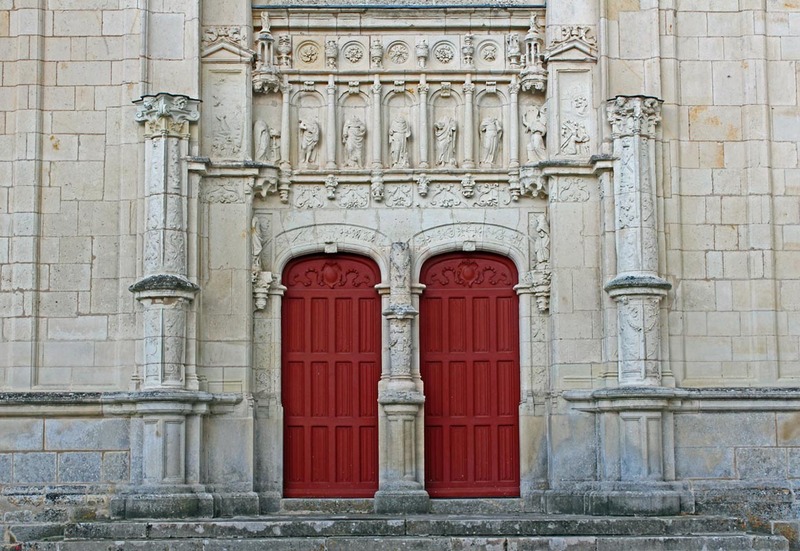 These are the doors of the church in Montrésor. It's the Collégiale St. Jean Baptiste. Notice how the heads of the statues over the doors are missing. Twin red doors in Montrésor. These are the ceremonial front doors of the church. They were locked when we visited, but a side door was open for visitors. We were the only people inside that day. Another one? Really? Well, I just couldn't resist this shuttered window. I like the iron brackets. I like the cut-out hearts. The whole building was like this. You gotta have heart. Click to ventriculate. The shutters on our house are brown. Because it's a relatively new house (built in the mid-1960s), and because the roof tiles are brown, another color on the shutters wouldn't look quite right. Unless it was white. Maybe. But, all the original shutters had the same cut-out heart motif as those shown above. I think it's a pretty common thing here in our part of France. We only have one set of original shutters still hanging on the house: four panels that close over the large door between the living room and the deck, each panel with a cut-out heart shape. The rest have been systematically replaced with more modern metal or PVC shutters. 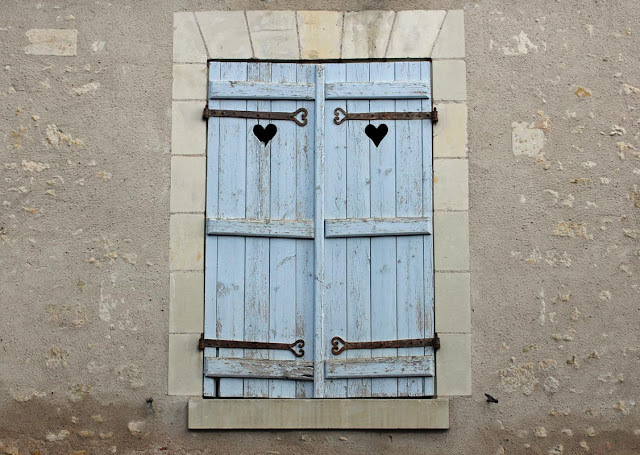 We found many of the original shutters stored in the garage and garden shed when we moved in, all with the cut-out heart shape. I lay them across saw horses and use them as makeshift work surfaces when the need arises. Yet another building in Montrésor, this one is kitty-corner from the church at the top of town. I'm continually fascinated by the way a building's windows, doors, stairs, and stone elements seem to "interact" with each other coupled with the little dots of color from flowers and plants. 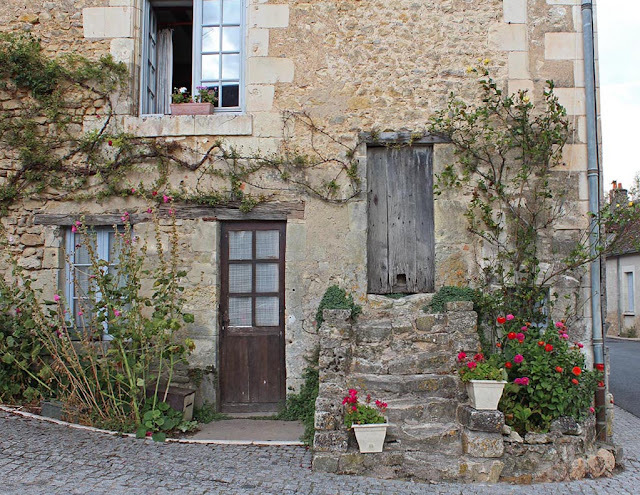 The cobblestone street in front of this house curves upward and back, leading to the château. 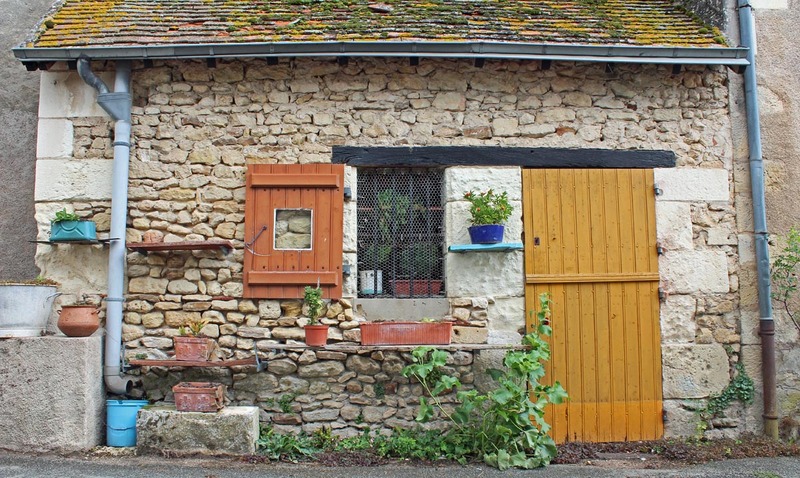 In France, most buildings are made from stone, terra cotta or concrete block, or more recently, concrete. Usually that building material is plastered over with a stucco layer to make it smooth and finished looking. The colors of the buildings are determined by their stone (if it's exposed) or by the color of the stucco layer and/or paint. Building colors are normally muted in shades of beige or gray. Color is introduced by painting window mullions, doors, and shutters, and by adding flowers in window boxes and planters. This pattern is repeated all over France and varies by region, depending on the types of materials historically available in those regions. Yet another facade, right next door to yesterday's, I believe. Again, note how nothing is really fancy or high-end. But it all still works. When I do find something that's fancy and high-end, even though it looks pretty, it feels unreal to me, like a Disney set. This little house actually looks lived in. It could also just be a storage building or garden shed. Who knows? I know it's just an illusion, old versus new and all that. 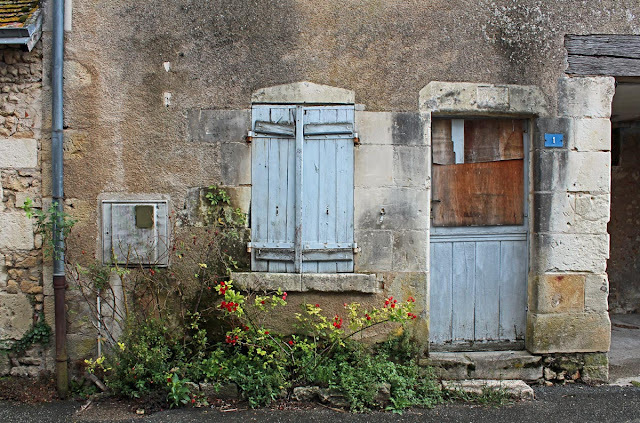 There is so much that is old in France and not abandoned, still used, still lived-in. Your eyes get used to it. Even though my house is approaching fifty years old, it looks darned new compared to much of the building stock around us. Montrésor is designated as un des plus beaux villages de France (one of the most beautiful villages of France) and, as such, has many picturesque buildings and views. 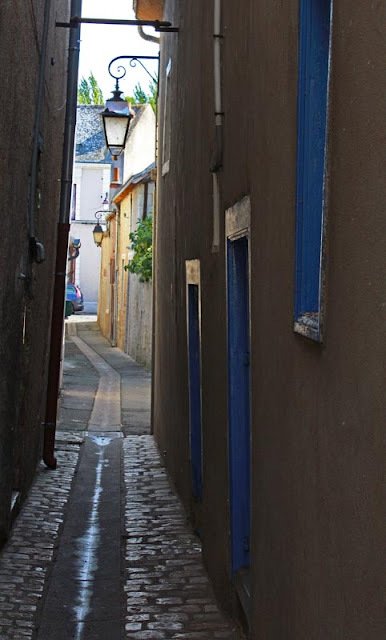 Among them are many small houses on little streets. They're not all maintained to the highest level, but they have a certain quality that makes them pretty. A boarded up door and a shuttered window with some overgrown plants. Nice! This one is along the street that rises up from the river valley toward the castle and the church. The château at Montrésor includes the ruins of a medieval fortress and a more "recent" renaissance wing, seen here. Construction began on this section in the late fifteenth century. Getting our bearings before a walk through town. That's Ken on the right with friends Chris (left) and Barbara (middle) as we begin our walk along the river below the château.